Banners with images of the 96 fans killed by the crush at an FA Cup game between Liverpool and Nottingham Forest have been hung at St George's Hall. 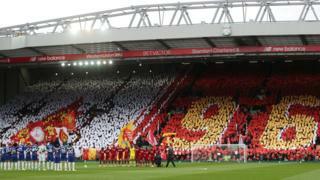 A minute's silence will be held on Monday in Liverpool at 15:06 BST - when the match was halted on 15 April 1989 at Sheffield's Hillsborough ground. Liverpool's mayor said the city would "stand together in solidarity". Under the law at the time, there can be no prosecution for the 96th victim, Tony Bland, as he died in 1993 following brain damage - more than a year and a day after the disaster. The jury failed to reach a verdict on Mr Duckenfield but the Crown Prosecution Service said it planned to seek a retrial. However, Mr Duckenfield's lawyers said they would oppose the prosecutors' application for a retrial. Plans for speeches, performances and prayers on Monday evening have been cancelled by the city's council to avoid a "legal risk" to any "future decisions made regarding ongoing legal proceedings", Mr Anderson said. Wreaths will be laid at St George's Hall in a ceremony on Monday morning, with 96 lanterns lit in memory of the victims. St George's Hall will be lit up red every evening this week. The words "Never Forgotten" will be displayed on screens outside Lime Street rail station and on the M62.